Firstly with Apple, the release of Mac OS X Lion (10.7) in 2011 saw the end of 32-bit processor support. Rosetta which allowed earlier PowerPC software to be translated to run on Intel-based Macs was also removed, though software requiring a PowerPC G5 processor wasn’t supported anyhow. Apple’s Universal Binary Programming Guide (Second Edition) from 2009, covers Rosetta in more detail from Page 65. The anticipated release of Mac OS X (10.14) later this year which will be possibly named after yet another Californian landmark, is touted to remove 32-bit application support altogether. (I’m not familiar with California, but I think Mojave and Eldorado may be suitable naming candidates.) Even still using the current High Sierra, chances are your old copy of Adobe Illustrator CS4 or other software from the OS X “cat” days won’t work as well if at all. Microsoft’s Windows 10 on the other hand is still available for 32-bit systems, and has been known to run on some rather dated hardware such as AMD’s Athlon 64 3200+ processor, from way back in 2003. Their graphic designers even went to the trouble of creating new icons for those running even older storage mediums. Tape drives despite being around for decades is the exception, with IBM and Sony having jointly developed a 330 TB tape in 2017. With the possible exception of tape drives, you’ll be hard pressed to find these storage mediums on a Windows 10 PC. 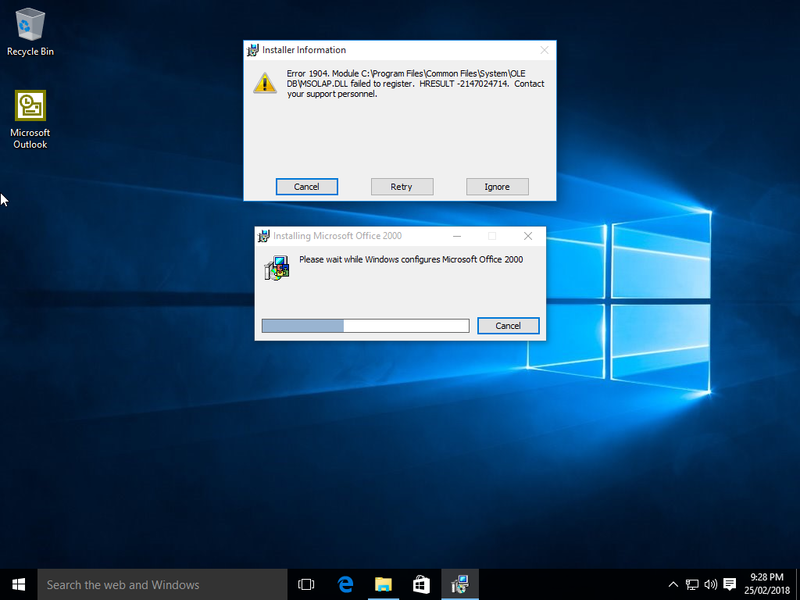 In this post though, I’m focussing on what software can still run on Windows 10. While the software I’m testing would be better suited for a Windows 3.1 or 98 PC, it was really just a case of curiosity as to how these would work after nearly 25 years. My conditions for the test were simple. Install and run the application as originally intended without any form of workaround, nor touch the Windows compatibility settings. I knew it wouldn’t be without some issues, such as accessing Help files. Since the release of Windows 3.0, using Windows Help was considered the norm. The Help files themselves would be identified by the HLP file extension, with much of the content in rich text format (RTF). Originally these were opened using the viewer WINHELP.EXE, though later changed to WINHLP32.EXE for 32-bit applications. From Windows Vista, support for Windows Help was dropped in favour of the newer HTML Help standard. This was partly due to security concerns as HLP files had macro capability. Users of Windows Vista, 7, and 8.x, were able to download WINHLP32.EXE from Microsoft (identified as KB917607) in order to view these old HLP files, with macros disabled by default. Microsoft decided to pull the pin altogether by not offering this for Windows 10. 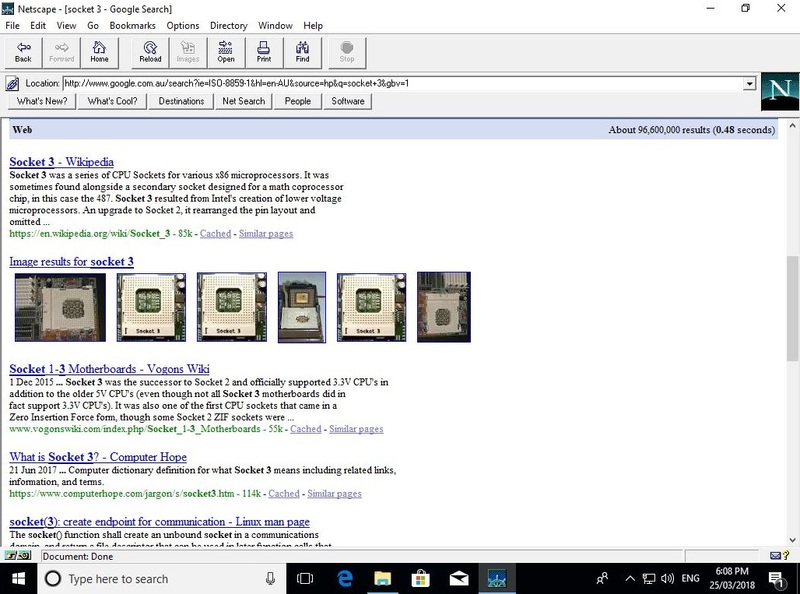 WINHLP32.EXE still exists but its only function is to open up your web browser, and display the knowledge base article from the Windows Support site. Unofficially, there is a workaround to use the Help download intended for Windows 8.1, though is a bit fiddly. Using VMware Workstation 14 I proceeded to install Windows 10 upon creating a new virtual machine, more specifically version 10.0.16299.309. It was set up as a single-core machine, with 3 GB of RAM, IDE hard disk, and a floppy drive in order to use disk images for software installation. In order to experience any success, you need to use the 32-bit version of Windows 10. Unlike the 64-bit version, this contains an optional feature named NTVDM (NT Virtual DOS Machine). In summary, this allows the execution of ancient 16-bit DOS and Windows applications, and 32-bit protected mode DOS applications. As it’s not installed by default, there’s two ways NTVDM can be installed. One can proceed by bringing up Windows Features. This can be found in the Start menu search by either typing Turn Windows features on or off or as optionalfeatures which is the file itself buried under the Windows’ System32 sub-folder. Note that typing optional features with a space directs you to the settings found under Apps within Control Panel and is not relevant at all. NTVDM is found under Legacy Components. On 64-bit Windows, only DirectPlay is shown. 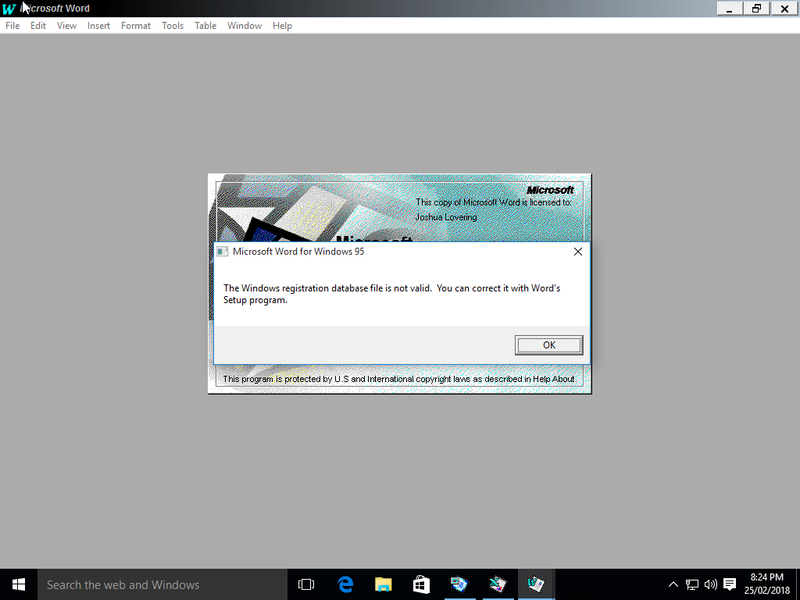 With the Windows Features dialog box appearing, NTVDM can be found under Legacy Components. Alternatively just executing a 16-bit EXE file for the first time prompts a request to install NTVDM as well. Once installed, an instance of NTVDM.EXE will run in memory upon the execution of an old DOS or 16-bit Windows program, appearing as Windows 3.x’s Program Manager on the taskbar. 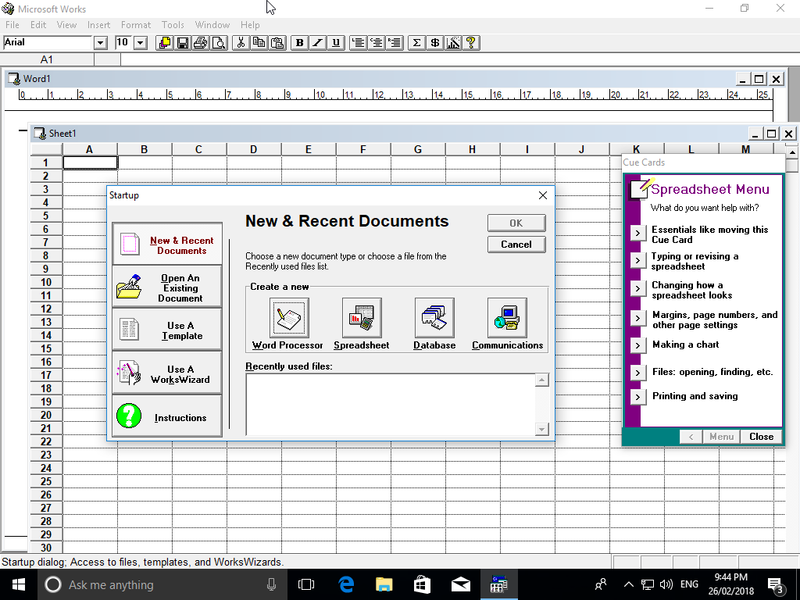 The first piece of software attempted was Microsoft Office 4.3, originally intended for Windows 3.1 dating back to 1994. Installation went without a hitch and was able to load and use Word 6.0, Excel 5.0, and PowerPoint 4.0 successfully. Access 2.0 was the most problematic and wasn’t able to run at all. As I later discovered similar issues would appear for subsequent versions, such as “out of memory” errors. 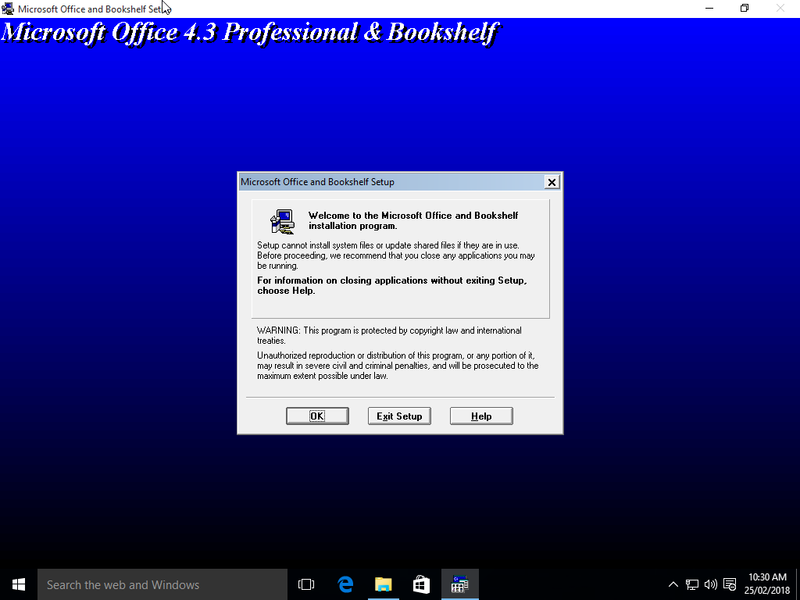 Installing Office 4.3 onto Windows 10. Notice that instead of the Setup program appearing on the taskbar, NTVDM is shown instead. It was observed that icons stored in 16-bit EXE files don’t see the light of day, and instead only a generic program icon is shown. The applications that could run began to fail from the second attempt, with a message appearing stating an illegal instruction occurred with NTVDM. The following day when I tried, the applications could run again. I guess reliability would improve had a spare physical PC been used instead, given how random this would occur. NTVDM would frequently experience a crash upon executing a program. Continuing with Microsoft Office, versions 95, 97, and 2000 were also attempted. 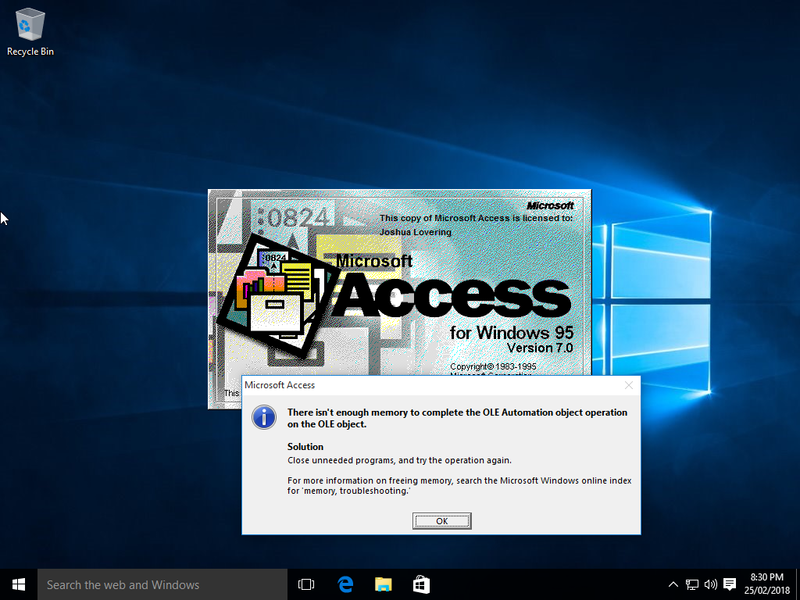 With Office 95, again Access would fail to start. Word would mention issues with the Windows registry on startup, but would otherwise continue and function okay. Excel and PowerPoint were the best performers overall. Office 95 applications do have an anomaly compared to other versions that affects the title bar. For whatever reason, Microsoft decided to italicised its own name and force gradient colour on the title bar. Whilst these customisations still show, it appears to be the source of trouble when using the window buttons (i.e. to minimise, maximise, and close the application). I might be attempting to maximise the window, only to minimise the window instead. Visually on screen it appeared I was clicking on the intended button but in fact was really selecting another button or none at all. Word 95 would error on startup accessing the Windows registry, but would otherwise work okay. Access 95 would crash on startup and unusable. Word, Excel, and PowerPoint 97. Installing Office 2000 was problematic. 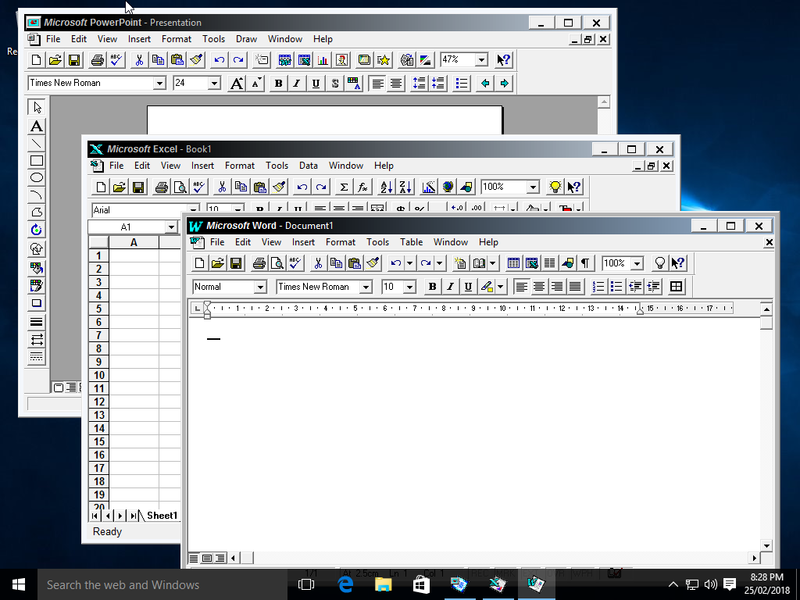 Word, Excel, and PowerPoint 95. Office 97 was the best out of the versions tested overall for installation and stability. 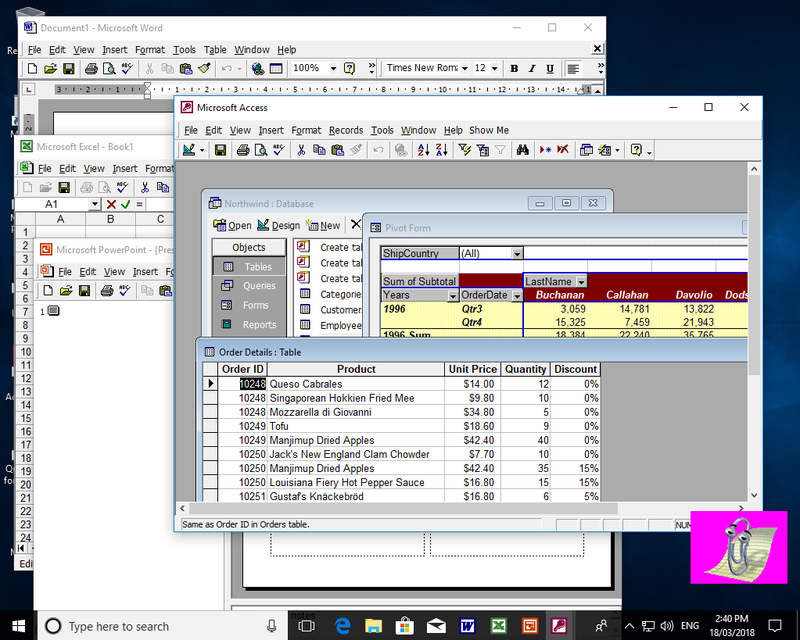 Oddly enough an application window when not maximised would not utilise transparency effects over the taskbar, whilst Office 95 applications would do so fine just as with a modern application. Office 2000 was by far the worst for installation, repeatedly prompting for “Error 1904” and ODBC related messages. After hitting the Ignore button several times, Setup would complete. Despite installation errors, a brief test with the applications suggested they were working as expected. Unlike earlier versions, Access 2000 was also usable. The Office paperclip named Clippit, which had been known to some as a cause of irritations, lost its transparency layer. When Clippit had a light bulb moment to offer help, the globe would sit above the pink square. Office 97 had Office Assistants within an actual window, so aesthetically appeared better on Windows 10. Microsoft Office 2000 – this time Access would run. After Office I went to its smaller cousin, Microsoft Works. 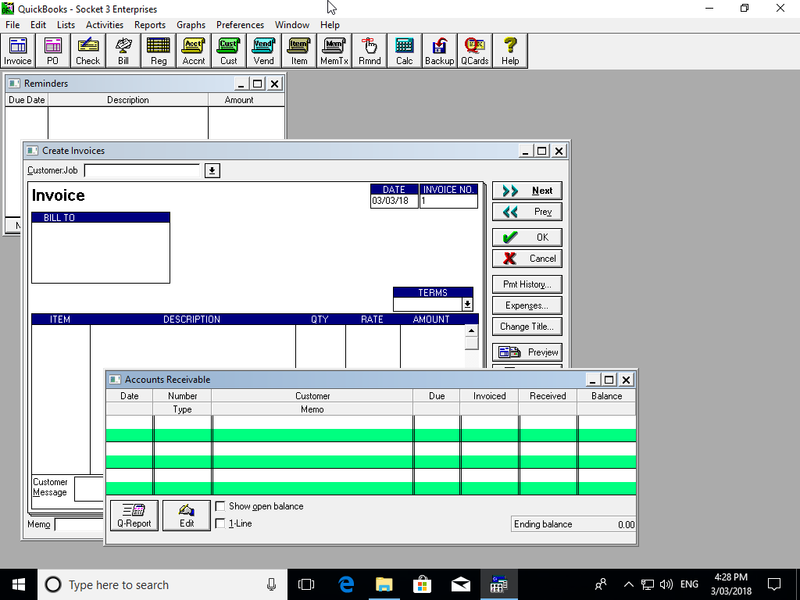 Version 3.0 just like Office 4.x, was the last to run on Windows 3.1. Overall it ran okay for common tasks. Noticeable issues were not being able to access Help (though Cue Cards were fine), and WordArt not functioning when using the word processor. This was consistent amongst 16-bit applications. 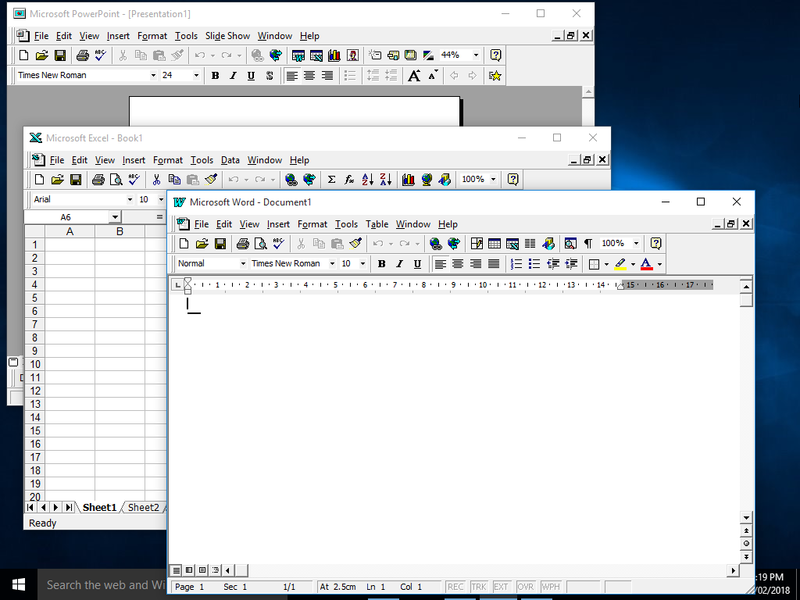 Version 2.0 of Word for Windows from a modern perspective is still more feature rich than WordPad. For general word processing tasks the application worked well, though on some occasions I wasn’t able to close it. Anything treated as a printer in Windows 10 would show, though selecting properties for these would cause Word to crash back to the desktop. I then attempted to print to PDF, and although prompted for a filename, the file itself wouldn’t save. 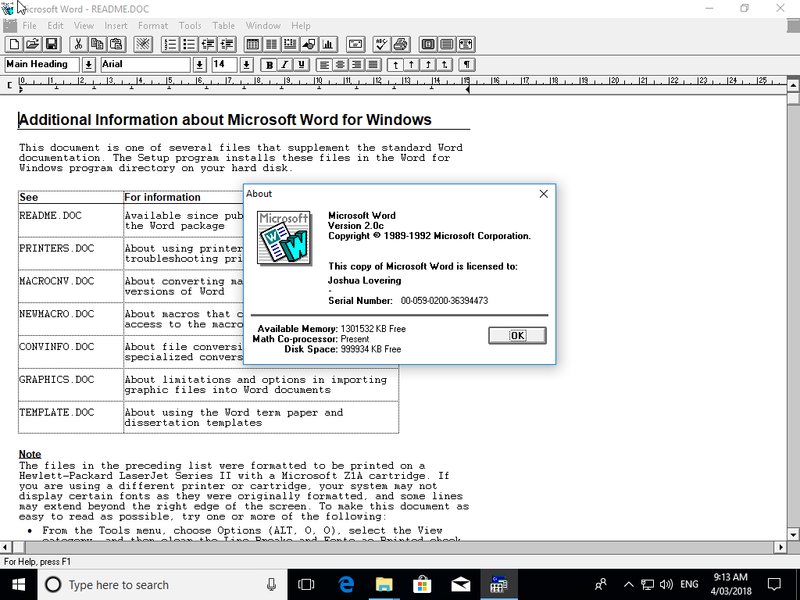 Microsoft Word for Windows 2.0c. 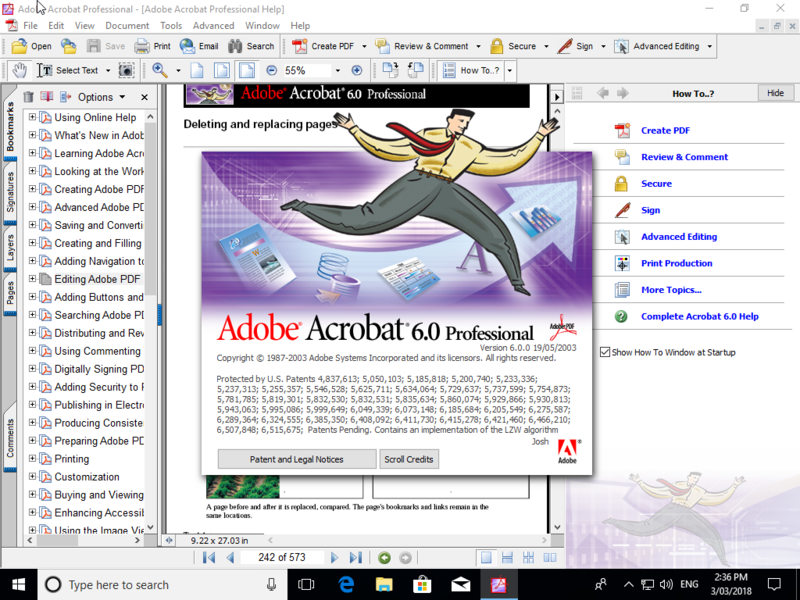 Microsoft Publisher 2.0, was the first and last to be designed for Windows 3.1 (Version 1.0 was originally intended for Windows 3.0). The application was mostly smooth sailing, however the below error message would appear when choosing to insert WordArt. No surprise really. I was able to successfully print to PDF, unlike Word 2.0. 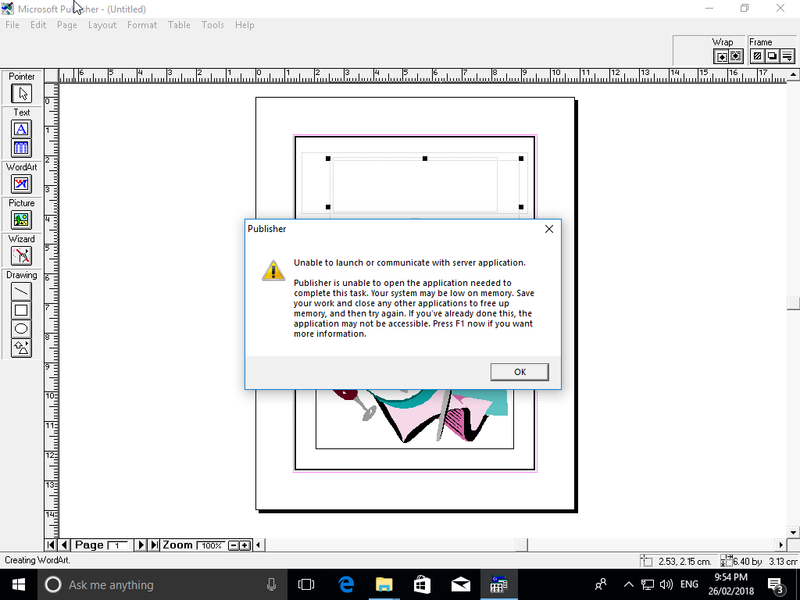 Microsoft Publisher 2.0 – this error appears after selecting to insert WordArt. 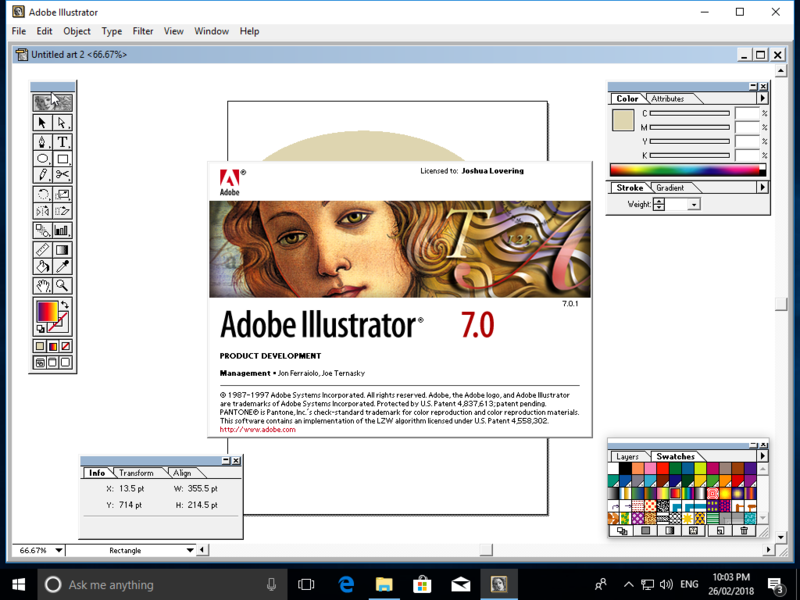 Some other applications I tested that ran mostly fine on Windows 10 were Intuit QuickBooks 3.0, and Adobe’s Illustrator 7.0, Photoshop 4.0, and the more recent Acrobat 6.0 Professional. For Acrobat, versions 4.0 and 5.0 which are closer in age to the other software trialled, failed to install at all. Microsoft Word 5.5 for DOS, and PC Paintbrush 1.05 from 1987 were also unsuccessful. 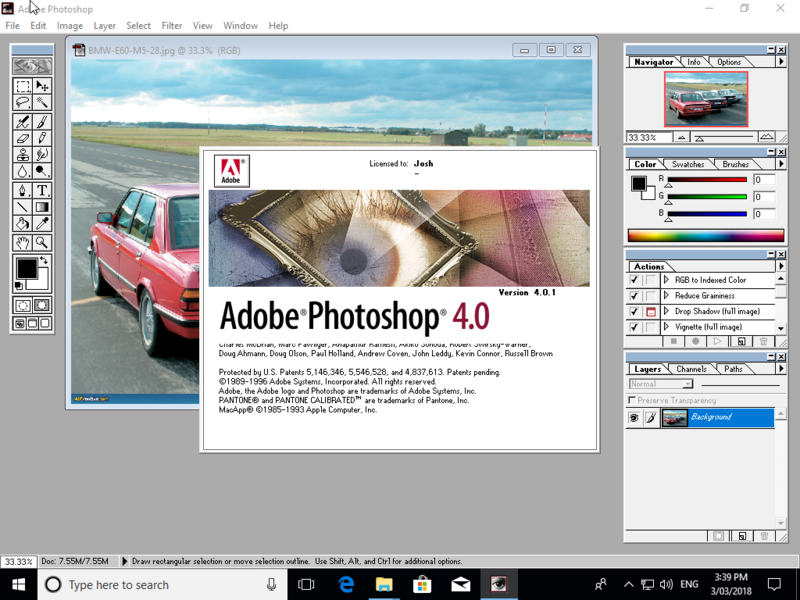 Originally for Windows 1.x and 2.x, the PC Paintbrush window and menu bar would appear, only to close after advising there’s no memory available. It goes without saying that running Windows software dating back around 25 years is never recommended for a magnitude of reasons, best left to the virtual PC world. Or if you are like me who actually owns some 486 and Pentium computers! In saying that, arguably 80% of home users could probably still get by with Office 97 and Photoshop 4.0 for typing resumes, home budgeting, and touching up JPEG images for example. It’s when you start requiring integration to cloud storage, newer file formats, or needing to perform analysis on a 100,000 row spreadsheet that it becomes infeasible from a functional sense. If anything this shows the versatility of Windows, that despite the software falling out of support for this amount of time, it will still run for the most part. Much of the software here had an equivalent version for the Macintosh, particularly for System 7.x and MacOS 8.x systems. Performing this exercise just wouldn’t work considering the transition in hardware architectures, not to mention how fundamentally different Mac OS has changed over this period of time. I haven’t been the only one seeing how older applications behave. One Microsoft post focussed on Office products up to version 2003. Excellent article. I have tried these programs but in the original Hardware, an art in Windows 10. Thanks!